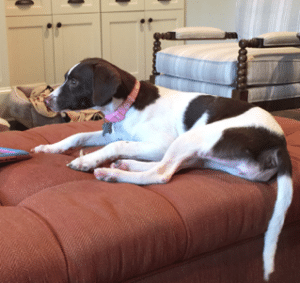 We recently welcomed a new addition to the Peters family, a 20 lb bird dog/beagle mix we rescued from our favorite animal rescue organization, Angels Among Us. We call her Byrdie because she reminds us of a bird dog and has shown tendencies to point at birds, mice, snakes, you name it. Although I really didn’t want a second puppy dog, Birdie has quickly become a formidable member of the fam. The Floataway Cafe is one of the most expensive meals I’ve ever had in Atlanta. For a gourmet meal on the patio with your dog, you will be hard pressed to find finer dining than at Floataway. By the way, this is the sister restaurant to Bachanalia, which is widely considered the finest restaurant in the city. This is a great Old 4th Ward “new American” foodie spot. Your dog will love the great heated patio and the amazing craft cocktails even better! Much like Floataway, you’re going to dine well here. In my single days, this was the place to be in Virginia Highlands. Neighbor’s always has great, cold beer on tap with casual pub fare. Your dog belongs here with you, and they have one of the best patios in all of Atlanta. I can’t tell you about my favorites without mentioning K-Pub. This is our family’s go-to spot for a great, casual dinner in our own Brookhaven neighborhood. We walk here, and they have a killer patio. Your pup will have lots of friends here. If you are dog folks like us, you can rest easy in Atlanta and have fun with your pet as well as enjoy some of the best food around! The Peters Company wants to help you and your furry friend find a home so give us a call today at 404-419-3619. ← Just Listed :: Furnished Condo in Brookhaven's Villa Sonoma!